We are excited that the Olympics are kicking off. While my 4 year old looks forward to watching the sports, I want to make sure he understands that nations all over the world come together to make these games possible. We already did one flag craft, but we decided to dive a little deeper into the symbolism of the Olympics and the Olympic colors with this activity. We started with a discussion of the 5 interlocking rings, in 5 colors – blue, yellow, black, green, and red. I explained that the 5 rings represent the 5 continents that participate in the games. We looked at a map of the world, and discussed the concept of continents. We then circled the 5 regions that send athletes to the Olympics: The Americas (North and South), Europe, Asia, Africa, and Australia/South Pacific. I explained that the colors were chosen because every country that participates in the Olympics has at least one of those 5 colors in their flag. I asked him which colors the US flag has, and he said red, white, and blue, and then we looked at the rings, and confirmed that both red and blue were included in the ring colors. I chose one country from each of the 5 continents, and we looked at the flag, to confirm that they all had at least one of those 5 colors. 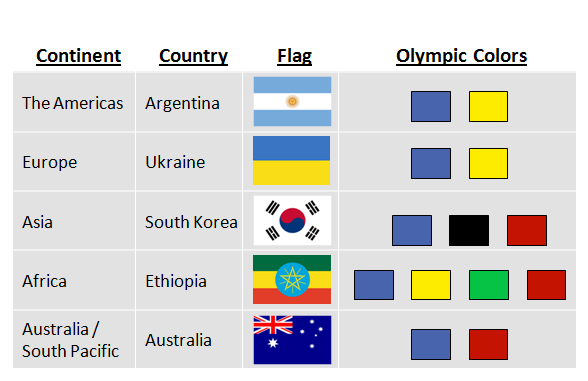 As we watch the games, we will check out the flags of the nations, and look for these colors as well. 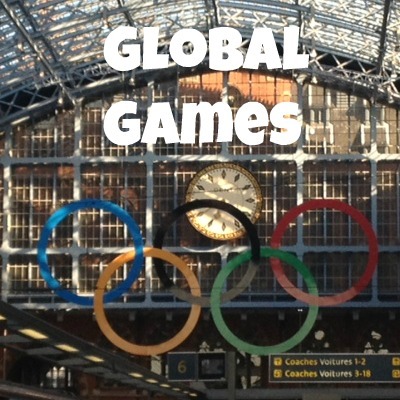 This activity was a fun way to demonstrate the global scope of the games, and introduce some new countries!